Shoes come in all styles & colours + they can make or break an outfit! 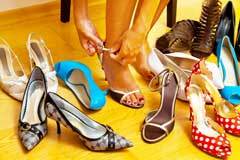 Shoes are big business in Britain with spending at almost £8 billion a year, according to Mintel. The recession seems to have encouraged splurges on shoes and accessories. What is it about shoes that we love so much? Designer Sam Edelman says: “Your shoe size doesn’t change, shoes don’t make you look fat, they just make you feel good.” Who wouldn’t agree! Shoes can be a great impulse buy – one high street store (New Look) boasts of selling a pair of shoes every two seconds, proving that the women of Britain are more than just a little bit in love with their footwear. Before you hit the shops, think about what you want your new shoes to do for you and how hard you want them to work (especially when buying boots), only then think about the style, shape and colour! Invest in shoes and boots that will last; take care of them – polish and re-heel them when necessary, store correctly, love what they can do for your legs and how they can make you feel! If they are uncomfortable we will see it in your face! Clean them before you leave the house!